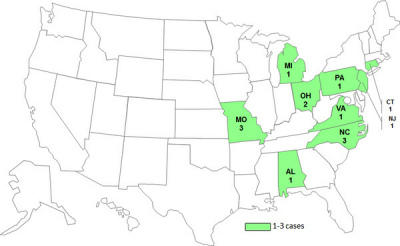 The CDC announced that 14 people in 9 states have been infected with the outbreak strain of Salmonella Infantis linked to recalled dry dog food made by Diamond Pet Foods. Five people have been hospitalized; no deaths have been reported. The dog food in question was manufactured at a single plant in South Carolina. The food has been linked to some of the human Salmonella infections through pulsed field gel electrophoresis (PFGE). People can contract bacterial infections from contaminated pet food several ways: they eat it, they handle the food, don’t wash their hands, then eat or prepare food, and they can get the infection from infected pets. Illnesses began between October 8, 2011 and April 22, 2012. The patients range in age from an infant less than one year old, to an 82-year-old. The median patient age is 48 years. Seventy-seven percent of the patients are female. Nine patients gave information to the government about their illness; of those nine, 5 were hospitalized. Ten patients were interviewed about contact with animals and foods in the week before they became ill. Seven of the 10 patients reported contact with a dog. Five of the patients could recall the dog food they purchased; 80% said that they were in contact with dry dog food produced by Diamond Pet Foods. Anyone who buys pet food should pay attention to recalls. If you have any of the recalled products in your home, discard them. And if you have symptoms of a Salmonella infection, see your doctor as soon as possible.